After more than five years of marriage and many wonderful dinners out together I can predict with a high level of accuracy what Mike will order from a menu. Any cocktail involving bourbon, oysters on the half-shell, and a gloriously grilled pork chop will catch his attention without fail. So, when I spotted this recipe for Butter Braised Pork Chops with Pickled Blueberry Balsamic Sauce on Not Without Salt last week I knew it would be perfect for a special Friday night dinner. To be honest, I don’t always have the best luck trying to cook pork. I like it just slightly pink in the middle, but I have a tough time gauging the time and it ends up too raw, or over-cooked and dry. Neither option is ideal, so I was excited to try Ashley’s method of pan-searing and basting with a little bit of butter. It seemed like a simple, sure-fire way to cook a juicy, flavorful, restaurant-style pork chop. I have another confession: I adore dishes that pair fruit with a savory ingredient, so while the pork chop was geared toward Mike, the blueberry sauce was the element that really convinced me to try this recipe. Just the thought of the bright blueberries, tart with balsamic spooned over salty, meaty pork made my taste buds sing and the results more than lived up to my imagination. A brief note on juniper berries. I was able to find them in the jarred spice section of my grocery store (they look like dark green peppercorns), but if they aren’t available I’d substitute a sprig or two of fresh rosemary to get the herbal, piney scent they add to the sauce. Place the fresh blueberries in a bowl then strain the balsamic mixture through a sieve over the fruit. Allow the berries to sit at room temperature for at least 15 minutes. The sauce can be made up to a day in advance and refrigerated. Rewarm before serving. Sprinkle the pork chops generously with kosher salt and ground black pepper. Set a large stainless steel or cast iron skillet over high heat, then add 1 tablespoon olive oil and 3 tablespoons butter to the pan. When the oil shimmers and the butter sizzles carefully add the pork chops to the pan. Cook in batches if necessary to prevent crowding the pan. Cook on one side undisturbed for 3 minutes, then flip the chops and again let the chops sear for 3 minutes. Add the remaining 3 tablespoons butter and thyme sprig and with a large spoon start basting the chops with the butter. Flip the chops repeatedly and continue to baste. The chops are done when a thermometer inserted into the thickest part of the chop reads 135°F. This should take about 7-8 minutes. Remove the chops from the pan, cover with foil and rest for 15 minutes. Serve with the pickled blueberry-balsamic sauce. Slightly adapted and re-written from Butter Braised Pork Chops with Pickled Blueberry Balsamic Sauce by Ashley Rodriguez of Not Without Salt. Yes! I used a 8” cast iron skillet, tongs, and a long-handled spoon (key since the pan is hot! ); along with a paring knife, small sauce pan, medium bowl, liquid measuring cup, measuring spoons, and a small sieve. A plate for resting and aluminum foil round out the necessary equipment. Mike was nervous about the post-sear flipping, but the tender, juicy results more than convinced him. The pork was perfectly cooked with a golden crust and deep flavor that worked beautifully with the herbal, fruity blueberries. I served the chops over wilted garlicky kale, with a handful of fresh blue berries, a few dabs of goat cheese, and a sprinkle of slivered almonds. Heaven. These pork chops are deceptively simple combining a relatively small number of ingredients with results that are far greater than the sum of the parts. I can’t wait to try this cooking method with other fruit sauces. Peaches or cherries maybe? I can only think of two occasions when I’ve eaten schnitzel in restaurants, but both were memorable. I’ll also admit that the first time I tried it I wasn’t overly impressed – it seemed a little heavy and not overly flavorful, but Mike won major points by ordering it in a restaurant on an early date just so I could try it, even though it was August and he probably would have preferred something else. Not an especially auspicious beginning, but fast forward several years to our trip to Vienna last spring. Our Austrian friends confidently recommended dinner at Figlmüeller a restaurant famous for their schnitzel, and I figured there was no better time to try it again than in the heart of schnitzel territory. The schnitzel was in a word: glorious. Deeply flavorful, about the size of a medium thin-crust pizza, and perfectly accompanied by fresh lemons and a glass of gewürztraminer – the experience rekindled my interest in German food. Brief nerdy side-note: wienerschnitzel is a protected term and means specifically schnitzel made with veal. The word schnitzel is broader and encompasses both pork and veal. Similar to say, Champagne vs. sparkling wine. Trim the boneless pork loin chops of any fat before placing them between two large sheets of plastic wrap. Use a rolling pin or the flat side of a meat mallet to pound each piece until it’s about 1/4 inch thick. Generously sprinkle both sides of the pork with salt and pepper. Measure out the flour and breadcrumbs onto two large plates. On a third large plate, carefully beat together the egg and water to create an egg wash. Dredge each piece of pork in the flour, followed by the egg wash and lastly the breadcrumbs. Gently press the breadcrumbs to help them adhere to the egg wash.
Place the breaded pork on a parchment paper-lined baking sheet, cover with plastic wrap and rest in the refrigerator for 10-15 minutes. This step will help the breadcrumbs to adhere and prevent them from falling off during the frying process. It also gives you a few minutes to clean up and start heating the oil – multi-tasking! Next, pre-heat the oven to 325 degrees F. Heat the olive oil in a medium sauté pan over medium-high heat until it shimmers. Carefully place two pieces of breaded pork in the hot oil at a time. Cook for 2-3 minutes on each side until golden brown and crispy. Remove the cooked schnitzel to another parchment lined baking sheet and keep warm in the oven while the second batch sautés. Drain the cooked schnitzel on a paper towel briefly and serve immediately with lemon wedges and a sprinkle of parsley. Fairly, assuming you have enough large plates. I used a rolling pin to flatten the pork loin chops, three dinner plates, two baking sheets, one medium sauté pan, a small cutting board, a chef’s knife, metal spatula, and both dry and liquid measuring cups and spoons. An instant read meat thermometer offers peace of mind. The secret weapon of this recipe: clear plastic wrap. It turns your counter into another plate and prevents contaminating a clean. Second runner up: parchment paper. Makes clean up easy and helps keep the breading crispy in the oven. Mike and I both have German/Austrian blood, respectively, running in our veins, so maybe that’s why we liked this so much? But really, who doesn’t like tender meat in a crispy coating lightly dressed with lemon juice? Schnitzel is perfect with a simple arugula salad, and extra bonus: a short cooking time coupled with a breading process than can easily be done ahead of time means dinner can be on the table in well under an hour. Works for me! 0:32 – Ina says she likes to make a cozy dinner on nights when there’s a “snap in the air.” We’re having a snap alright – I’m freeeeezing! 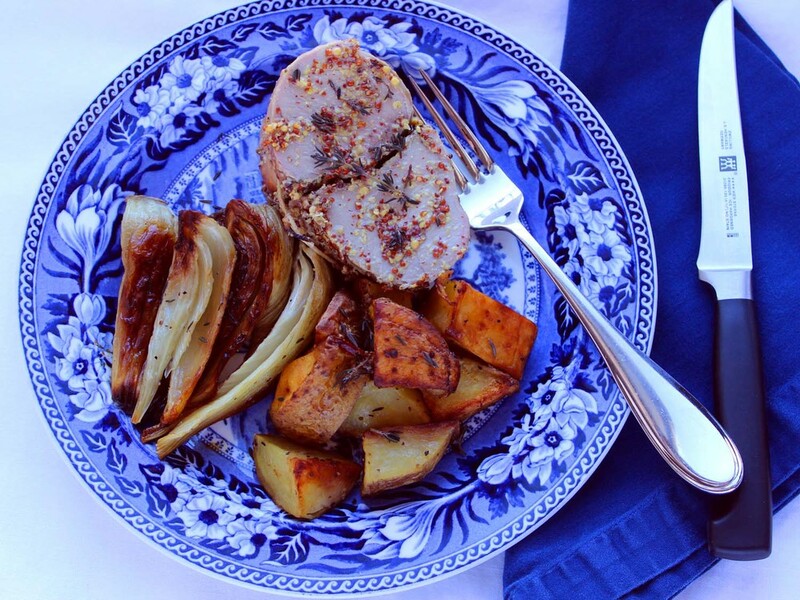 1:21 – First up on the menu: Roast Loin of Pork with Fennel which she calls a one pot meal. 3:30 – She’s not kidding about this one-pot meal stuff – the vegetables go right from the cutting board to the roasting pan for seasoning. No spoon either, just clean hands! 4:05 – With a garden designer coming to dinner it only makes sense to take a trip outside to cut some fresh English thyme to use in the next phase of the recipe. Is it weird that I think that’s the height of decadence – fresh herbs for the picking at all times? 5:39 – Now for the pork loin marinade – garlic, salt, pepper, and a pun on thyme taking time. Oh, Ina you loveable goof. 6:44 – Now the mustard goes in and this looks like a delicious marinade/paste/rub hybrid. Yum. 10:00 – While the vegetables roast Ina starts on dessert: Rum Raisin Rice Pudding. Uh-oh. This isn’t the first time Ina has tried to convince me that rice pudding is a good idea. There was also this episode. 11:17 – Okay, well there’s rum involved, but I still just can’t even. No, I’m so sorry Ina, but I just can follow you down that dark path. Shudder. 12:33 – Another trip to the garden, this time for the flower arrangement. White dahlias, natch. 13:25 – Now for a little Entertaining 101. Ina says that the purpose of flowers and especially candles on the table is to focus attention inward on your dining companions. Which makes sense, I suppose. 14:06 – I thought (hoped) we were done with the rice pudding, but it was not to be. It’s back and it looks like a bowl of my culinary nightmares. Too dramatic? 19:39 – Whew, she put it in the fridge out of sight. Now Ina is adding the pork loin on top of the vegetables. 20:14 – A quick check in with Edwina and Charlie (her lab-mix?) shopping for plants. She doesn’t strike me as a rule follower, but Ina has a strict color scheme for her garden, so she caves and buys a giant branchy shrub with purple flowers. 21:42 – The pork loin is done and resting under it’s little foil tent just in time for Edwina to arrive toting a giant bush. 22:10 – Edwina insists that the spindly purple thing be planted immediately and Ina goes right along with her. dinner plans be damned. 23:58 – Present number 2 is a pair of bright pink, opera length gardening gloves. Okay, this I can get behind and Edwina is back in my good graces. I know she was nervous there for a minute. 26:27 – Ina is making Sautéed Cabbage as a side dish and I can’t decide whether I’m brave enough to try this. 27:31 – Also, do cabbage and fennel count as green vegetables? I could maybe be on board with it if I were confident there were some worthy vitamins in there. 28:44 – Edwina has the purple creeper (not it’s real name) in the ground and now it’s time to plate up dinner. 29:53 – Dinner is served and it’s like the cozy fireside meal of my dreams, except for dessert which in my world is chocolate cake. Cheers to cake! This seems like a very low-stress dinner, which I am 100% on board with. I need to further consider this cabbage situation. It’s a complex issue. Is it still presumptuous to bring someone something for their garden if you’re their garden designer? Is it like being a personal shopper for shrubs? You might be wondering why on earth I’d want to make Roast Loin of Pork with Fennel after last month’s debacle with the Herb Marinated Pork Loin, but the reason is simple: I refuse to be defeated by a cut of meat. Also, this recipe did not involve pan sautéing and I bought a new instant read meat thermometer, so my confidence was restored. The recipe steps are just slightly fussy – allowing the pork loin to stand with the mustard/garlic paste marinade, roasting the vegetables first, then adding the meat – but none of them are at all difficult. I noticed that Ina just tossed the cut vegetables right in the roasting pan with the spices, which even saves on an extra bowl. The only small changes I made to the process were rotating the pork loin halfway through the cooking time (about the 25 minute mark) to ensure even cooking. I did not want a repeat of my last pork loin which was too pink in some spots and dry in others – not good. I also felt that the vegetables were plenty done after 30 minutes of roasting alone, plus another 40-45 minutes with the pork, so while the pork rested I turned the oven off and just kept them warm. Yes, but (are you noticing a trend?) the roasting pan is a key element – I used it to toss the vegetables with the butter and seasoning and then put it right in the oven. I also used a small prep-sized food processor, medium cutting board, and chef’s knife. Measuring spoons, tongs, a wooden spatula, cotton kitchen twine, and a meat thermometer (essential!!) round out the kit. I made Roast Loin of Pork with Fennel for Mike and I earlier this week and we were both really, really pleased with the results. The pork has great flavor from the garlic and mustard paste, but the unexpected star was the fennel. Neither of us could recall having roasted fresh fennel before and we both loved the caramelized richness. Next time I’ll throw in a few more bulbs so that there are extras. Mike’s one addition would be to make additional mustard sauce to serve over the slices of pork loin. . I would definitely make this again for a cozy dinner just for us or when we have guests. The Set-up: Ina’s friends, Frank and Steven, have guests coming for dinner and everyone is stuck in traffic. Guess who is saving the day? 2:37 – As she minces, then measures the rosemary and thyme Ina advocates for fresh herbs vs. dried. I think my cooking improved a lot once I started using fresh herbs. 3:15 – Trust that Ina wishes there were a more “glamorous” way to marinate meat other than a plastic Ziploc bag. 4:01 – Thank goodness we don’t have to see it for too long, the pork loins in their pedestrian plastic are whisked away to the fridge. 5:23 – Wait a minute, Ina is bringing the flowers for the table too? Did Frank and Steven forget they were having guests or are they just champion procrastinators? 6:09 – In any event, Ina selected a white and green flowers since that’s what Frank likes and is arranging them in a short drinking glass. Pro Tip#1: low arrangements on the table so people can see over them. 9:34 – I think Ina’s worried about the opinions we might be forming of Frank and Steven, but I’m afraid it’s too late. I now have them pegged as irresponsible hosts! 10:20 – Moving on to the Greek Panzanella – an Italian dish reimagined with Greek flavors like olives and feta. 11:36 – A little vegetable chopping montage – bell peppers, red onion, cherry tomatoes, English cucumbers – so soothing! 12:48 – As she’s making the dressing for the salad Ina acknowledges that’s “unusual for her” but that she has one exception to her fresh herbs rule: oregano, which she finds too strong in its fresh form. 13:14 – Pro Tip #2: Crush dried herbs, like oregano, between your hands to release the remaining oils in the leaves. 14:23 – A brief check-in with our delinquent hosts as they drive home. That’s right, Frank & Steven, you better sing Ina’s praises for saving your dinner party bacon. 15:43 – Back to Ina as she finishes the Greek Panzanella by adding Kalamata olives and diced feta. I’m still waiting to develop a taste for olives – so far they’re still on my “avoid” list. 19:19 – Ina’s still trying to rehabilitate Frank and Steven’s image, but it won’t work no matter how “big [she] owes them for so many things” or how “delighted” she claims to be to make Plum Crunch for them. 20:05 – Ina is stirring the sliced plums together with flour, cassis, and sugar, which will combine to make the “goo” of the filling. She says it takes a little judgment to determine when a little more or less flour is called for, depending on how juicy the fruit is. So tricky, I still don’t know for sure! 21:32 – Ina compares Plum Crunch to Apple Crisp, but I think this might be even more low-maintenance, because she isn’t peeling the plums. 22:21 – As she crumbles the topping over the plums Ina says that one of the pleasures of baking is the scent filling the house – isn’t that so true? Especially on a rainy, chilly fall day. 23:46 – The “dinner to-go” is packed with the efficient-getting-things-done music in the background and then Ina’s “so out of here” on her way to save the day! 26:07 – Frank and Steven tried to get out of helping, but Ina put them to work setting the table. Way to not let them off the hook on everything! 27:23 – The guests have arrived and Ina is plating the Greek Panzanella and baking off the Plum Crunch so it will be warm out of the oven. Man, is she good! 28:38 – Raiding the freezer which contains only vodka and vanilla ice cream. Hilarious. 29:12 – Ina seems to have been included in the dinner after they released her from the kitchen. Gracious to the end, though, she says they can call her for take out anytime. I love the idea of translating a dish from one flavor profile to another – could a Middle Eastern version of panzanella be far behind? Ina is probably the best friend ever – I can’t picture a time when I’d be able to pull off an elegant dinner for six at a moment’s notice. 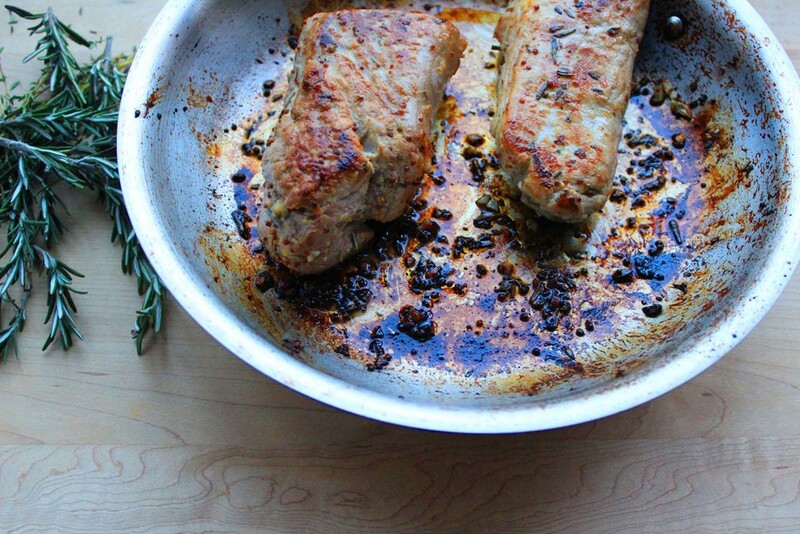 The flavors and ingredients of the Herb Marinated Pork Loin sounded delicious and the preparation straightforward, but I actually had a lot of trouble cooking the meat. 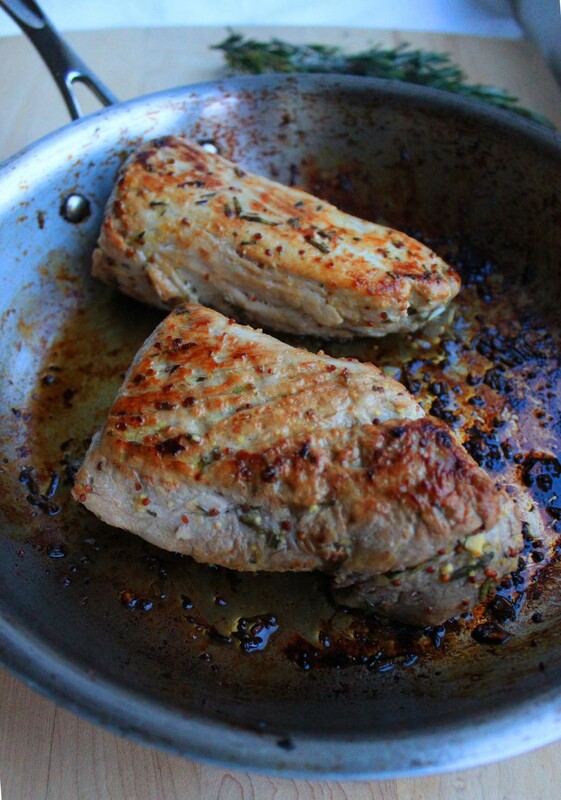 The recipe calls for browning the pork loins in olive oil and then placing the sauté pan in the oven to finish cooking. I found that even with the oil quite hot and the meat fairly clean of marinade it took a long time to brown the exterior and again the cooking time in the oven was too short to cook through. When I sliced the tenderloins I found the thicker pieces weren’t just pink, but actually a little raw looking even after resting. Not good and more than a little frustrating when they look so delicious on the outside! In the future I’d recommend adding another 5-7 minutes to the time in the oven and rotating the meat halfway through the cooking to make sure they’re evenly done. Yes, definitely. The most important item is a sauté pan large enough for the pork loins. I also used a chef’s knife, microplane grater, measuring spoons and liquid measuring cup, as well as tongs, a meat thermometer and aluminum foil. To be honest, I only tasted a small piece of the Herb Marinated Pork Loin and the flavors were wonderful, but I was so aggravated by the cooking process that all I wanted was peanut butter toast. Mike, on the other hand, did have the tenderloin for dinner and deemed it delicious. He claims he’d like to have it again, but only if I’m sure there will be no kitchen meltdowns in the process! My plan: learn from my past experience and try again; if you have success, I’d love to know your advice too!